The Galapagos Islands are an adventurer’s playground. If you want to sit on a beach all day, go spend your money elsewhere, because the activities and excursions on offer with Quasar Expeditions are as much an integral part of the trip as the exotic animals you’ll encounter. The classic vessel of the M/Y Grace has sea kayaks, snorkeling gear and wet suits on board to tire you out before dinner even begins. Now let’s get on with the itinerary, shall we? Once our group flew into Baltra Island, we took the dinghy and made a short crossing to the M/Y Grace. All luggage was kindly handled at the airport by the amazing crew who transferred bags directly to our cabins. As I mentioned previously, this 18-passenger iconic yacht was once the honeymoon location for Princess Grace Kelly and Prince Rainier. Ahhh, swoon. In the afternoon, we were again transferred via dinghy for our first adventure with SEA LIONS! I’m not usually one for favorites, but these creatures are just too playful not to make it to the top of the list. This introduction basically made everyone salivate at what was to come. Our 7am wake up call came early, but I’d get up at the crack of dawn any day for what we witnessed. This was were I saw my first blue footed booby – a Galapagos goal of everyone’s I do believe! The snorkeling here was one of my favorites throughout the entire trip because sea lions were out and ready to play. South Plaza was where I officially became a bird watcher. I didn’t expect to ever see the day, and I must admit…I’ve always been slightly confused by this “activity.” Who wants to sit around waiting to see birds fly? Well, this is me raising my hand now. I’m especially proud of this beaut I captured in-flight. No big deal. Stepping foot on this island, I felt like I was transported to another universe. At first glance it’s barren, colorless and dead. Once you delve deeper, you see it’s a bird paradise. Also known as Bird Island, I was snapping pictures like it was my job (because it is) and loving my new found bird watching hobby. The red footbed boobies were my favorite with their colorful beaks and bright red feet. The frigate birds, however, stole the show by nothing short of attacking us upon leaving. Later, our Naturalist mentioned that the birds were going for neon sunglass croakies, thinking it was food. Noted. Darwin Bay presented more boobies, sea lions and Sally lightfoot crabs all living harmoniously in and around a beautiful lagoon. The youngest and westernmost island brought us the largest colony of marine iguanas in the world. I know this to be true as they covered a vast majority of the island. It was hard to tell reptile from rock as the coastline came alive with these sea lizards found nowhere else on earth. Wildlife in the Galapagos are a different breed. They are incredibly apathetic towards people and simply are not moved by human presence. It was unreal. On the largest island in the Galapagos lives a perfectly round saltwater crater. Snorkeling near its walls led us to greener pastures as a carpet of algae covered the ocean floor, attracting sea turtles, sea iguanas and penguins! Even though this excursion was a glorified beach walk, it was one of the highlights. There exist some misinterpretations about the Galapagos, one being a lot of time is spent on tropical beaches. I hate to be the first to break it to you, but beach time is scarce, as many landings are rocky and jagged, involving sturdy footwear. This excursion presented some sandy shores and required zero footwear, which I appreciated. I’m an Arkansan through and through. The interaction with the different wildlife was incredibly fun. The top land predator and I got into a staring contest. The Galapagos hawk won. A crane and I hung out near the water. Ghost crabs are known the be some of the fastest animals in the world, but we caught up with them before they could disappear in their burrow beneath the sand. In the afternoon we were presented with black beaches and crystal-clear grottos formed by old lava. This was a memorable experience because the harmonious environment between the animals was especially evident here. As the sea lions were playing in the grotto, marine iguanas were a mere feet away enjoying the spectacle with sally lightfoot crabs. Be careful where you walk as these animals think of you as one of them, a friend in the making. As the majority of the group visited the Charles Darwin Research Station and the Giant Tortoise Reserve, Wade and I opted for scuba diving. Some say the islands are home to the best dive sites on earth, so I wasn’t about to let the opportunity pass me by. Note that all Quasar Expeditions are from Saturday to Saturday, allowing visits to the most important and remote islands. 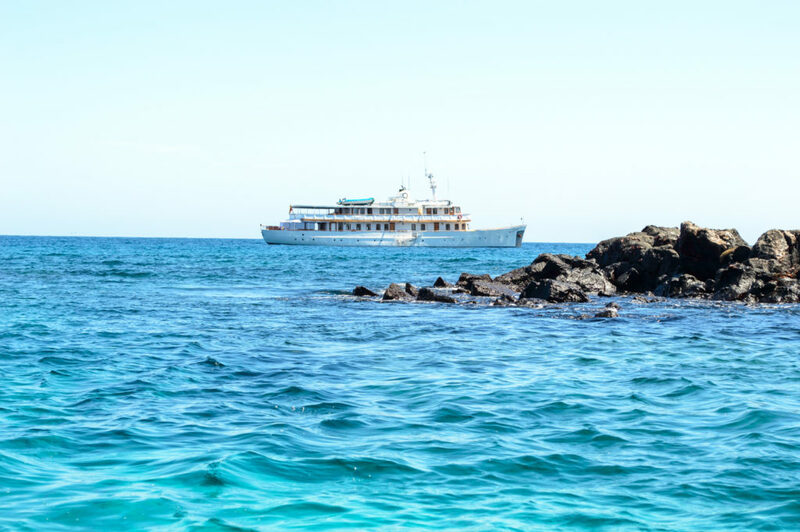 In an effort to minimize the environmental impact on the Islands, the Galapagos National Park authorities have decided that vessels cannot revisit the same site within 14 days. As a result, Quasar yachts now repeat the same itinerary every two weeks (instead of every week) and the company operates two different 8 day / 7 night voyages with two different yachts, the M/Y Grace and M/V Evolution. In an effort to help sustain this delicate ecosystem, Quasar has partnered with Free World United, a progressive graphic t-shirt brand that donates a percentage of every sale to worthy causes, to raise funds for the Galapagos Conservancy. For every cause-specific t-shirt you buy, Free World United will donate $10 to the Galapagos Conservancy, in an effort to raise $3,000. OMG I have to snorkel with the sea lions!!! They look so playful! What was your favorite animal experience from the trip? Hard question! I’d probably say scuba diving with hammerhead sharks, but snorkeling with sea lions was a close second. How do you take such amazing pictures? I just love you.